Inlet Cluster in the Lake Anne neighborhood sports is a small community of 63 townhomes. While none of them are directly on Lake Anne, the cluster has private dock at the inlet where residents can moor their boats. 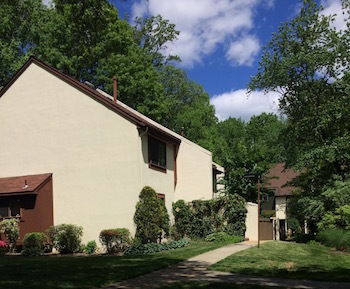 These contemporary 3-level, 3- to 5-bedroom homes were built in 1971. Every house has a carport space, and there is additional parking throughout the neighborhood. The cluster was designed for privacy, with the homes located behind the parking structures. Having been built in 1971, the trees and landscaping are mature—the neighborhood has a feeling of being nestled in the woods. Inlet Cluster is located off Wiehle Avenue just north of the Lake Anne dam. It’s about a five-minute walk to Lake Anne Village Center (or a quick paddle in the canoe). The local schools are Lake Anne Elementary, Langston Hughes Middle and South Lakes High School. 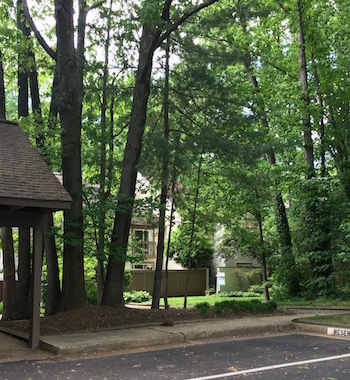 With easy access to Wiehle Avenue, the Reston Station and Toll Road are only minutes away. Which of the 15 Reston Association Pools is your favorite? Everyone has one, and it’s not always the one they can walk too. Some have water features for children, some are all lap lanes. One is Olympic sized, others feature great shade. Over the years, each pool has developed it’s own personality and attracts people for different reasons. You can see the full summer pool schedule here. Here’s a lowdown on what each pool offers so you can plan your day in the sun (or shade). This pool’s large wading area with a fountain is great for toddlers. There is also a covered picnic area and playground nearby. This pool features separate water basketball and volleyball areas, a diving board, and children’s splash area. For the parents, there is a large spa. The pool also features an ADA ramp into main pool. This pool features two shallow play areas, one of which has a fountain. For family day at the pool, there are also picnic tables, a grass beach area, and a picnic pavilion with grills. And don’t forget the spa! This heated pool is a family favorite. 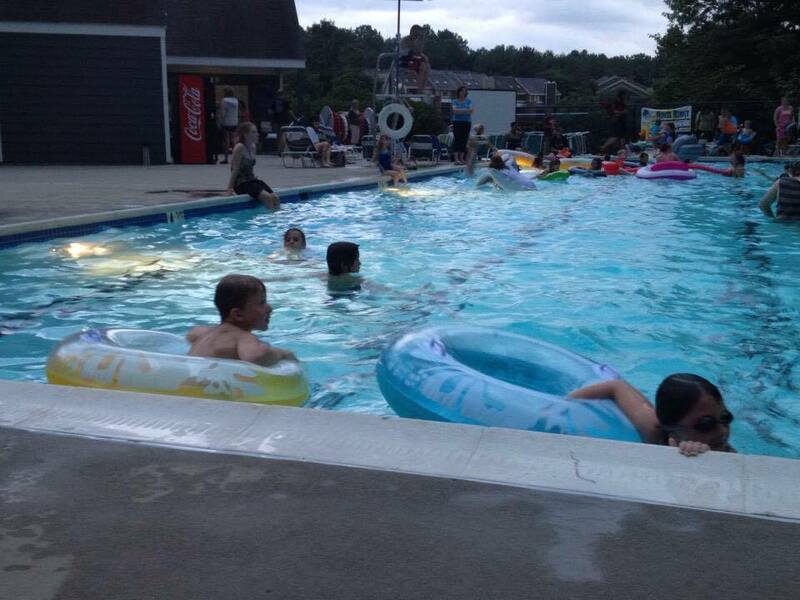 It opens early in the season and is the last pool to close in September. The pool features a spa, wading pool, ADA ramp to the pool deck, ADA hydrolift chair into the main pool, and shaded upper deck with picnic tables. This is a smaller and quieter pool than Glade, but feature a small slide for the kids. There is also a wading pool and small picnic area. This is the premier pool for families with toddlers. The zero-depth children’s pool (0-3 feet deep) has interactive fountains, a cold-water spa, and an interactive sand pit. The pool also has an ADA in-water wheel chair. This is Reston’s only 50 meter pool and is a favorite for serious swimmers. There is also a sand volleyball area, and two 1-meter diving boards, a wading pool, and a covered picnic area with grills. With plenty of sunny spots, these pools are great if you want to get some serious rays. Golf Course Island (11301 Links Drive, North Reston). There is also a large playground with grills next to the pool—perfect for summer parties. Lake Audubon (2070 Twin Branches Road, South Reston). In addition to your pool amenities, there is a boat ramp to Lake Audubon nearby if you want to take out your canoe or sunfish. If you want to spend the day at the pool without spending a day in the sun, these pools are perfect for you. 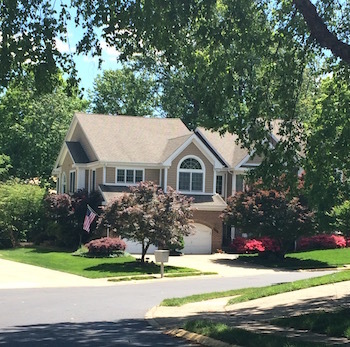 Ridge Heights (11400 Ridge Heights Road, South Reston). This pool is heated. It opens early in the season and is one of the last pools to close. You can follow Reston Association on Facebook and Twitter and get up-to-date schedule information; this can be handy when you’re wondering if that storm coming through will close the pools. Facility closures that affect a pool for more than two days will be posted here as well. You do need your pool pass to use the pools, and fortunately you can buy them online. Just click here. Maybe I’ll see you at the pool. Celebrate the Lake Anne Coffee House Grand Opening! When I’m not helping people find their dream home in Reston, I’m spending time with my family at our coffee shop and wine bar at Lake Anne. That’s right—about a year ago, our family purchased the Lake Anne Coffee Shop, remodeled it, and added a wine bar into the mix. And this weekend is our official Grand Opening! We’ve been open since November, but we wanted to wait until the summer farmer’s market and craft markets opened to have our Grand Opening Weekend, because to us, that’s when Lake Anne really shines. We are celebrating with new spring menu items, including our already-famous spinach salad with strawberries and goat cheese and the very best basil-mint balsamic dressing EVER. We also have added some great summer whites and rosés to the menu. Personally, I’m most excited about the seasonal signature craft cocktails. They will be unique to us, most importantly, they are super tasty. Not to worry, we will also have house made lemonades with some unique twists (basil-blueberry lemonade), new iced teas, matcha (hot and iced), and cold brew and tonic (it's good, I swear). Join us for a 4-course, seasonal dinner by Chef Meagan. Each course paired with a wine from Division Winemaking Company. Wine maker Kate Norris will be in attendance to discuss her wines. This is going to be great. Reservations required, no menu substitutions. 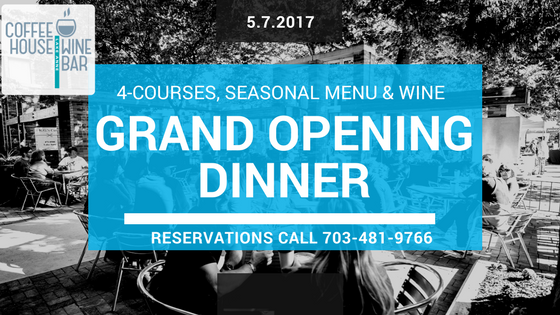 Call 703-481-9766 to make your reservation. It will be the first of many wine dinners we hope to do with all of the interesting winemakers represented on our wine list. We hope to see you!